Presented by Calvin Knickebocker, in concert with the Freedom Community Club at Camp Calumet, courtesy of the NH Humanities Council. Presented by Gwendolyn Quezaire-Presutti, courtesy of the NH Humanities Council. Presented by Carrie Brown, courtesy of the NH Humanities Council, following FHS Annual Meeting and pot luck supper. Wednesday, May 6, 7 PM, Freedom Town Hall, refreshments served. Wednesday, June 17, 7 PM, Freedom Town Hall, refreshments served. Wednesday, July 15, 7 PM, Freedom Town Hall, refreshments served. Wednesday, August 19, 7 PM, Freedom Town Hall, refreshments served. Our Founding Fathers: What Were They Thinking? Wednesday, September 16, 7 PM, Freedom Town Hall, refreshments served. Wednesday, October 21, 7 PM, Freedom Town Hall, refreshments served. Preceded by the FHS Annual Meeting Dinner, with a New England foods emphasis, at 5:30 PM. * Paired with book suggestion for further reading. Wednesday, May 21, 7 PM, Freedom Town Hall, refreshments served. Presented by Daryl Thompson (NHHC); Co-sponsored with the Friends of the Library. Wednesday, June 18, 7 PM, Freedom Town Hall, refreshments served. 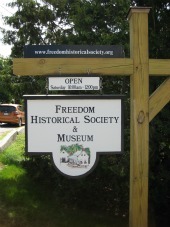 Presented by The New Hampshire Historical Society. Wednesday, July 16, 7 PM, Freedom Town Hall, refreshments served. Wednesday, August 20, 7 PM, Freedom Town Hall, refreshments served. Presented by Freedom Historical Society and Heritage Commission. Wednesday, September 17, 7 PM, Freedom Town Hall, refreshments served. Presented by Margo Burns (NHHC); Co-sponsored with the Friends of the Library. Wednesday, October 22, 7 PM, Freedom Town Hall, refreshments served. Preceded by the FHS Annual Membership Meeting and Pot Luck Supper at 5:30 PM. Carl Lindblade presents the story of the Mt. Washington Hotel and the International Monetary Conference at Bretton Woods. Wednesday, May 15, 7 PM, Freedom Town Hall, refreshments served. Jo Radnor presents: Humor in 19th Century New England. Wednesday, June 19, 7 PM, Freedom Town Hall, refreshments served. Thomas Hubka presents: Connected Farm Buildings of New England. Wednesday, July 17, 7 PM, Freedom Town Hall, refreshments served. Wednesday, August 21, 7 PM, Freedom Town Hall, refreshments served. Wednesday, September 18, 7 PM, Freedom Town Hall, refreshments served. Wednesday, October 23, 7 PM, Freedom Town Hall, refreshments served. Wednesday, October 17, 7 PM, Freedom Town Hall. Pot Luck Supper at 5:30 PM. Saturday, August 6 10:00 AM – Noon: “Antiques Appraisal” by Richard Plusch.